Film Friday: Not Hot Docs! Hot Fuzz! So there we were, all ready to write another post previewing the final weekend of the Sprockets International Film Festival for Children, when we realised that the film we wanted to bring everyone’s attention to, When the Show Tent Came To My Town, had already had all of its showings! Darn. So though we aren’t going to do a full review of the film, we’d just like to note that When the Show Tent Came To My Town is an absolutely brilliant Japanese-language film that deals with school bullying and friendships in an intelligent and moving way, and that if you get a chance to see it (even if you don’t have any kids) you should. It’s great. 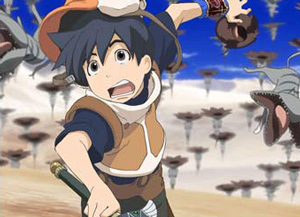 Still, there is at least one film showing at Sprockets this weekend that we’ve seen, and that’s Brave Story, an anime playing on Sunday at 2:40 p.m. at Canada Square. It deals with many of the same topics as When the Show Tent Came To My Town (bullying, parental difficulties, and so on) but takes a fantastical route instead. Heavily influenced by other aspects of Japanese culture (role-playing video games, for one) it’s not the deepest film but it has lovely animation, and a strong, unambiguous morality to the tale which is quite satisfying. Worth checking out (it’s for older kids, in our estimation, though, with some violence). Sprockets full listing is still available online, so take a look to see if there’s anything else that takes your fancy (you could also refer to our previous post on the festival). 7:15 p.m. How It’s Done (ROM) – Polish Politics in action! 9:30 p.m. The Bodybuilder And I (Royal) – Some dude’s absent father returns to his life…and now he’s ripped! There are plenty more though! Take a look at the (nice, readable) schedule on the Hot Docs website for more. And before we move on (because we almost forgot), we’d like to say congratulations to Sandra Cina for winning our Aqua Teen Hunger Force Colon Movie Film For Theaters contest with “You Will Sit In Your Seat For 127 Minutes While Moving Pictures Appear On The Screen In Front Of You. Enjoy!” There were absolutely stacks of amazing entries, but that one was the first to make us laugh until we cried. Sorry, everyone else. Anyway: films that you can see this week that are not at Hot Docs. We are specifically talking about Hot Fuzz. Which is the only film you need to see this week, really. We have to give some pretty huge props to John Harkness here because his review of Hot Fuzz is basically perfect. 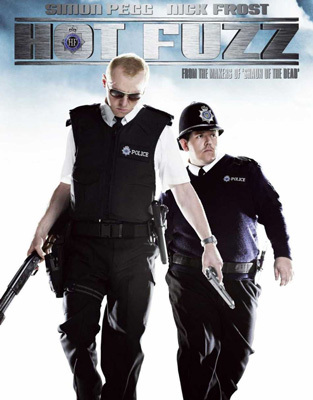 We’re not sure what else we could say, well, other than his standpoint (“Hot Fuzz is pure satire,” essentially) is just an opinion, and that Hot Fuzz actually works incredibly well simply as a totally hilarious, and totally great, buddy-cop film. A little slow to begin with, we’ll admit, but we actually cried a little bit (for reals!) when the action started happening, as it filled us with so much joy. So that’s that! That’s the only film you need to see this week. Well, there’s some other stuff out as well. Did you know, for example, that there’s a Slacker Film Festival on this weekend? It’s the first one ever, and apparently they were too lazy to think of a better weekend than the first weekend of Hot Docs to run it, so at least they’re consistent, right? Genuinely grimy types should check out Ilsa, She Wolf Of The SS tomorrow night at 10 p.m. At the Brunswick Theatre, though. Cheap, nasty Nazi sexploitation. The truest alternative to all of those documentaries running this week, really. Also out this week: Fracture, Year of the Dog, Orchestra Seats, In the Land of Women, That Beautiful Somewhere and Vacancy. None of those films are Hot Fuzz, it’s worth noting.